Place your order now to guarantee availability and to beat the rush! Studies show that businesses with beautified entrances attract more walk-by traffic and make between 12 to 35% more in sales, compared to businesses without beautified entrances. Shopping districts with plants and trees are more inviting and encourage customers to shop longer. 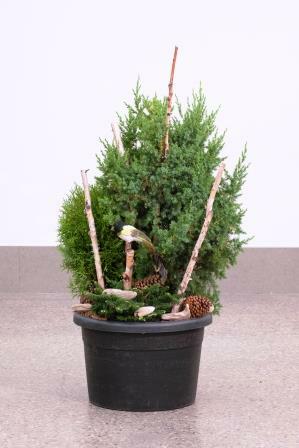 Get your winter planters today and start attracting more customers. Do you already have a pot you'd like to use? We do custom! Enjoy our custom planting service and have our designers professionally plant your winter pots and planters. Our experienced designers will choose top quality plants, fill your pots with nutrient-rich, professional-blend potting soil and attractively arrange the plants. This year, we are also offering 16" winter hanging baskets. Custom planters cost is 8.50/inch of container diameter (includes all plants, nutrient-rich potting soil, and professional design). Oversized containers may be subject to an additional charge. Diameter measured at the widest line on planter. Planting begins after October 15th. Very specific plant choice is not available. Suitable plant combinations are at the discretion of our designers. Patio pots must be empty of plants and soil. Replanting fee is payable in full upon our receipt of your empty planters at our greenhouses. Planters must be picked up within 1 week of completion. A storage fee of $10/week/planter will be added after 1 week. Delivery is extra charge. Home placement is extra charge. To place your order email bsaunders@holesonline.com or phone Bryan at 780. 419. 6806.